A Dickens of a Christmas - Dickens in your home!!! A Dickens of a Christmas ! 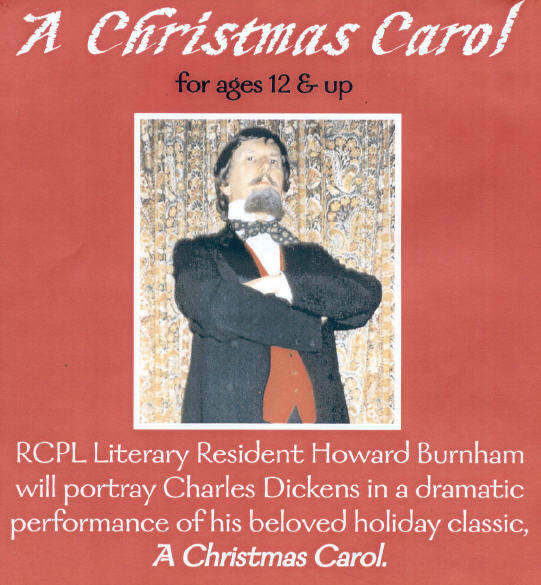 Howard Burnnham has been performing his solo Dickens "A Christmas Carol" in England and the States for twenty years. First in Malton, Yorkshire, (where Dickens reportedly saw the original of Scrooge's counting house), as part of the Malton Dickens Festival; and for the past ten years he has been the featured performer at the annual Myrtle Beach Dickens Shows and Festivals in South Carolina. NEW!!! Let ‘Charles Dickens’ entertain you and your guests this holiday season. British actor Howard Burnham (BBC and PBS) as Dickens will perform ‘A Christmas Carol’ in your home. An unique holiday treat! The entertainment can last an hour with Dickens explaining how he came to write his timeless Christmas classic; or shorter versions can be offered.